Fig 2: Responding to the comment by pressing "Ctrl + R" or right-clicking and selecting Post Reply. The second major change coming in the Colossus release is the adoption of the design elements from the Microsoft Office fluent user interface such as the ribbon, contextual tabs, galleries and live preview. To prepare for this change, we’re first building a prototype of the redesigned user interface and once we’re happy with it we will start refactoring the RSS Bandit application to enable swapping out our existing menus and taskbars with the new interface. Here’s where we are in the design prototype for next release. Let me know what you think in the comments. I am a user who subscribes to dozens' of blogs, and the number keeps growing. Ribbon is nice when it comes to organize a vast amount of features, but it has a major drawback of taking large amount of vertical real-estate, icons are hidden in different tabs so it takes additional clicks to get to. So for RSSBandit which I love to be a simple app, Ribbon would be more counter productive than its appearance. As for my current usage of RSSBandit, I only keep one toolbar, which only has 6 essential buttons I use the most. Vertical real estate is way more important than pretty. As someone who subscribes to several hundred feeds, I would love to see an optimized ribbon with contextual commands in each view - the mockup looks awesome! I would make the first three primary activities buttons by themselves and the rest can be narrower...which three are primary is debatable - I use "Update All", "Mark All as Read" and clip/save type stuff most often. The Facebook stuff looks terrific. Thanks for the continued efforts. a) don't put all messages in the list. This takes a lot of time and memory. 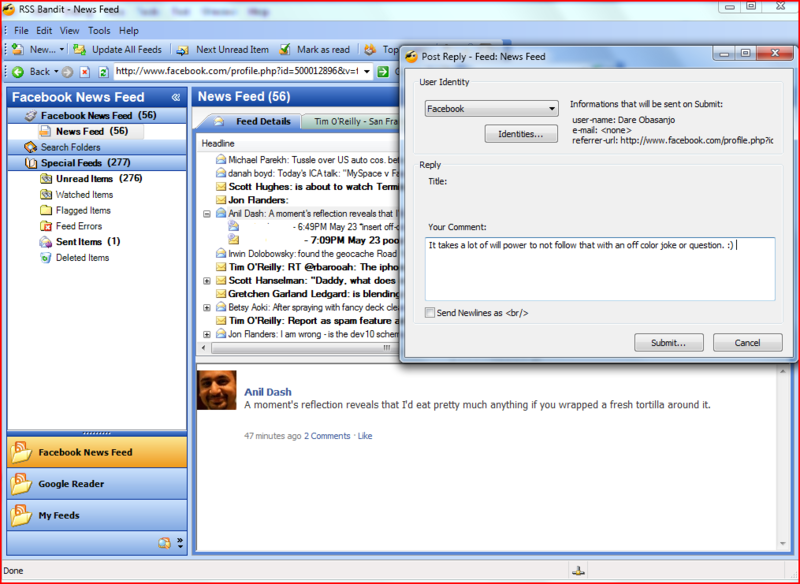 Only unread message should be added when one selects a feed or category. An option to show all could be provided. B) being able to filter the displa for a time window, without creating a seach would be useful. Having a box to show last N hours/days/weeks/months would be great. This is a viewing option and wold be retained until changed, evne when switching categories/feeds. Searches use their default time view. C) I see "tagged". Are you added tagging? If so GREAT!!! If you do, add the ability to export the tagged items to xml and csv. Also, please make sure that atgged items are not cleaned up. D) add an option to strip all html formatting from feeds as you create the xml to be displayed for the category/feed. Bad formatting for a feed can screw up the xsl and display. Be nice to have this a per feed/category option with a global default. Fine grained control would be terrific, so stripping embeds, sounds, images. scripts or all would be good. The Ribbon UI looks great, but based on other comments, I'm guessing it'd be nice to implement a 'lightweight' version of the UI (a-la Visual Studio's Full Screen mode?) might optimize vertical real estate. By the way, I gotta say that this is the first RSS reader that I really do enjoy using so cheers for a great app! © RSS Bandit — © 2003-2018 rssbandit.org; All rights reserved.